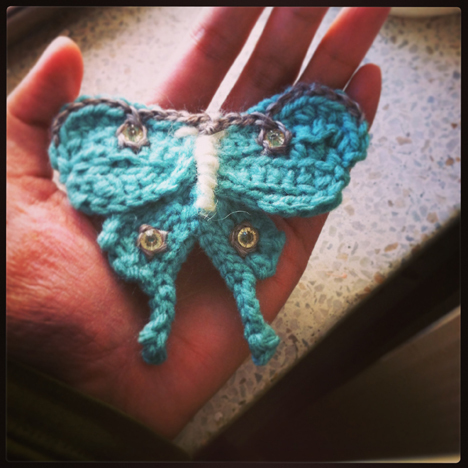 Hard to believe how happy this made me, to crochet something. Life’s been busy, and I feel rather depleted every day when I get home. But I know that if I carve out some time to make something rather than zonking out in front of the TV I would feel much better, much more energized, much more nourished in my spirit. I’ve been wanting to make a luna moth for a while. Was looking for an origami diagram actually, but couldn’t find any on the interweb. So I thought I’d go back to what I do best, with my trusty crochet hook and yarn. Someone I really admire once asked me what it’s like to crochet, referring particularly to the tiny anatomical heart I gave her. I said it’s like sculpting with yarn. 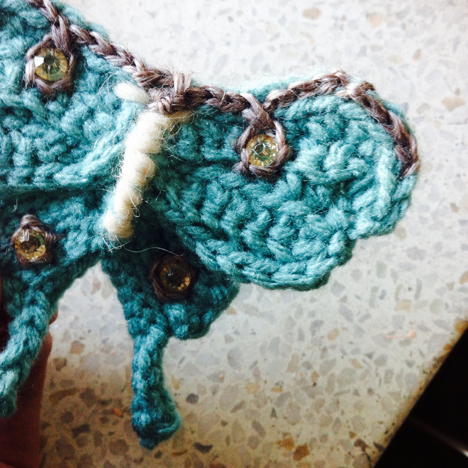 You see, it crossed my mine to write out a pattern, because I haven’t posted a pattern for a long time, but writing a pattern kind of takes away the spontaneity of free‐form crocheting, of sculpting with yarn, which was what I needed at the moment. But you can see that the veins on the upper wings are clearly off, so I might make another one to improve on it, and I might jot down the stitches then. I had some perfectly sparkly yellow beads for the eye spots. I don’t know why I choose to work in social services. Sometimes I wished I could go back in time and choose archaeology or paleontology as a major. Sometimes I think I would be much happier and less stressed out in general if I studied dinosaurs instead of the various ways people hurt one another. But I’m not so sure. Anyway, I was feeling depleted, so I made a moth, and it made me happy. That’s all I can say for today. 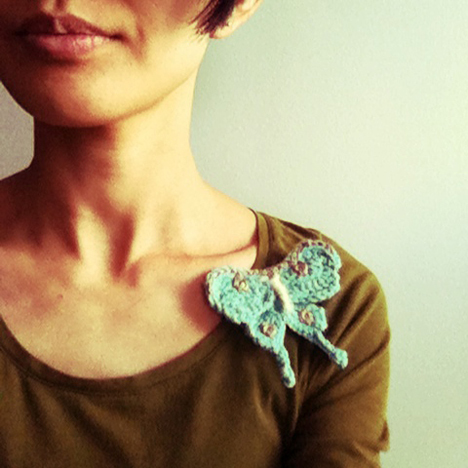 I didn’t sew a pin back on it yet, but I think it might look good as a brooch. Not too over the top, right? Wishing you a peaceful rest of the week. So pretty! YOU have a peaceful week, too! I love butterflies and of course Luna butterfly. Really cute and your choice of colours and materials are great! As soon as I can I will try exactly in your wonderful choice technique, materials and colours and I will let you know. I wish you a happy happy day! thank you! and thank you for sharing your maple key butterfly, i love how you painted them gold. I really resonate with that. It doesn’t solve any of life’s problems, but the ritual of baking something renews my spirit.